Once in awhile, I sit with my partner, and we invent a meal. I don’t mean that we work together in the kitchen, uh-uh, no-no, let’s not get carried away! Last night, we discussed the two poussin (little baby chickens) that I had in the fridge and what should be done with them. 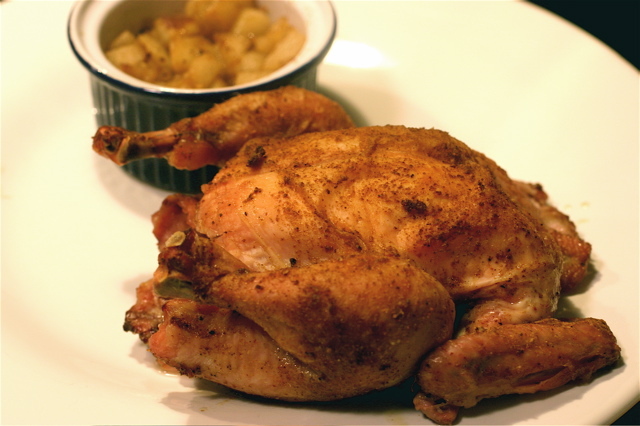 The concept revolved around roasted, spiced poussin, contrasted with pear. We wanted the sweet of the pear to balance the heat of the spice. That part was easy; the discussion got a little more heated over the vegetables. He was holding out for crunchy potatoes; I made some parsley-garlic potatoes the other night that were addictive, and I think he was craving some more of those. I thought parsley and garlic weren’t simpatico enough with the spices and the pear. I’m the chef. I won the argument: sautéed parsnips and swiss chard. 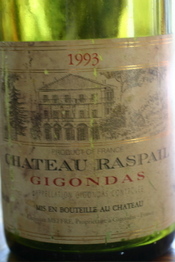 The consolation prize was that he got to pick the wine, and he chose brilliantly: a 1993 Gigondas. We have some amazing goodies stashed away in the wine cellar, and every now and then, for no particular reason, we bring one up and drink it. The poussin were rubbed with a dry spice combination of: cumin, ginger, Chinese 5 spice, coriander, adobe chili, salt and pepper. They were simply roasted with a whole clove of garlic inside. 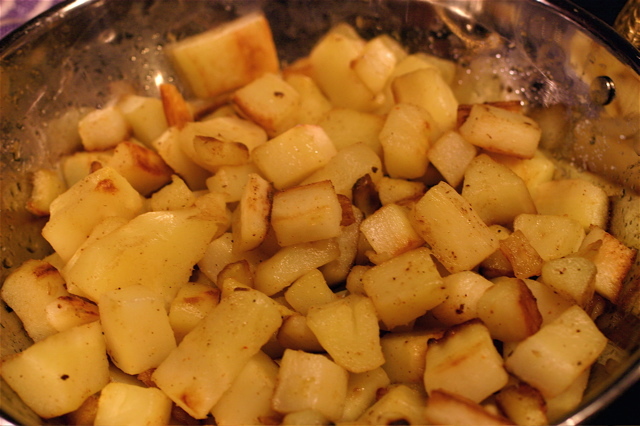 The pears were tossed with the same spice rub, sautéed in a little butter, deglazed with some rum and then roasted. 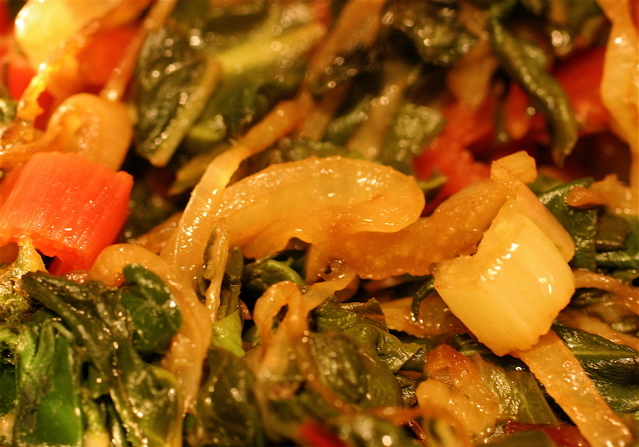 The parsnips were simply sautéed in a little olive oil, and the swiss chard was treated to some onions and finished with a little balsamic vinegar. The result? A waltz for the palate; the spices yielding and dipping to the pears, the parsnips eagerly engaging with the spices, and the chard acting as a friendly chaperone at the dance, giving the other flavors a chance to stand on their own. The wine was simply amazing. It was a full symphony on the tongue, complex, assertive, but with that wonderful gentility that comes from an old world wine. It’s not often that it all comes together like this, but when it does, sit back, recognize the moment and savor your good fortune.